The technology making strides, and medicine is one of the areas where the greatest impact is achieved. We have seen drones able to combat the spread of infectious diseases, a centipede millimetre administer medications in our body, organs created with 3D printers and, of course, a multitude of applications focused on the health field. this last paragraph is where you include the latest breakthrough achieved by researchers from the Emory University. This is a mobile application platform that can detect the anemia in any person with only a picture of his nails. The anemia, caused by lack of red blood cells or hemoglobin, affects nearly 2 billion people on the planet, what makes the blood disorder most common in the world. For diagnosis, the patients require a blood test to determine hemoglobin levels, is deir, an invasive test that involves costs and time. 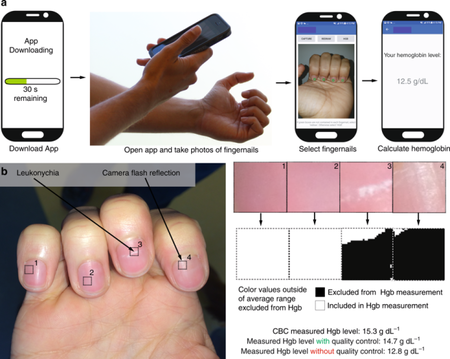 What is proposed by a group of researchers from Emory University is just a non-invasive test and instantly it consists of making a picture to “analyze the color and the metadata of the nail” through a mobile app. 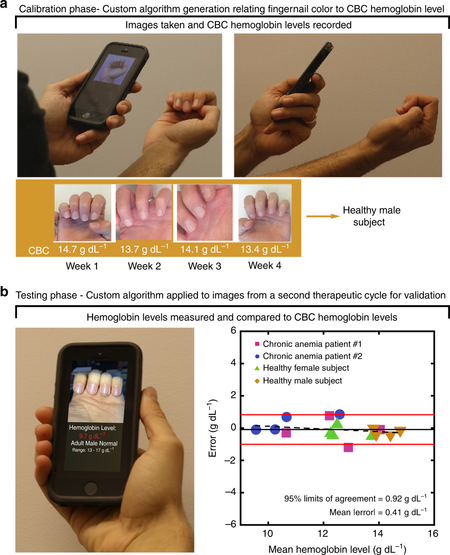 In their study, published in Nature, explained: “Our application calculates the level of hemoglobin by analyzing the color and the metadata of the photos made by the smartphone to the bed of the nail and detects anemia (hemoglobin levels < 12.5 g dL−1) with an accuracy of ±2.4 g dL−1 and a sensitivity of 97%". in Addition, the application includes a system custom calibration which reaches “an accuracy of ±0,92 g dL-1 of hemoglobin levels CBC (n=16),” and allows patients with chronic anemia control their hemoglobin levels instantly and remotely. To verify the accuracy of the application, we carried out a study of four weeks involving 337 people with different conditions of the blood, and various skin tones, including 72 healthy control subjects. The researchers claim that the application surpassed the doctors who evaluated the levels of hemoglobin after a physical exam. Recognize that it does not reach the accuracy levels of a blood test, but it is as good as or even better than many diagnostic tools approved by the FDA today. in Addition, to show the application in action, Robert Mannino, Emory University, he shared a video on YouTube in which we can see how the test is performed to two different people: the user downloads the app on his mobile, takes a picture of their bed of nails, and receive instantly a level of Hgb must that is displayed directly on the screen of the phone. The process didn’t even last a minute. as to its compatibility with the different operating systems, the study clarifies that have used the integrated development environment open-source (IDE), Android Studio to create a beta version of the application of measurement of Hgb on Android, and the IDE Xcode, the owner of Apple for the beta of iOS. We have before us, therefore, a mobile application platform that, for the moment, is not available to the public (it is only a study), but that throws some results that are promising enough as to think that we could have access to this and other similar technologies very soon. The news Develop a mobile app, it is able to detect if someone has anemia with a photo of your nails was originally published in Xataka Android by Laura Sexton .